Rockman EXE Transmission (ロックマン エグゼ トランスミッション, Rokkuman Eguze Toransumisshon?) is a game developed in Japan and later localized as Mega Man Network Transmission. It was developed by Arika and published by Capcom and ShoPro Entertainment for the Nintendo GameCube console. The game was first released in Japan on 6 March 2003, North America the following June, and PAL regions the following July. 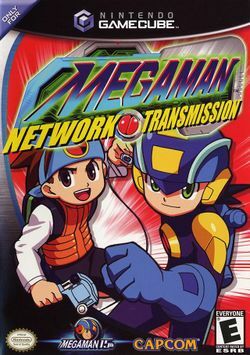 Network Transmission is part of the Mega Man Battle Network series, which originated on the Game Boy Advance (GBA) handheld. Taking place one month after the events of the first Megaman Battle Network game, the plot follows the protagonist Lan Hikari and his online avatar MegaMan.EXE in their fight against the "WWW" (World Three) organization and its attempt to unleash and spread the infectious "Zero Virus" into cyberspace. The player controls MegaMan through a set of levels that require actions such as jumping, sliding, and shooting, as well as the use of special "Battle Chips" that grant the player various combat and movement abilities. Network Transmission combines action and platforming gameplay elements from older Mega Man games with the strategy and a few role-playing elements as defined by the Battle Network series. The development team's intent was to meld these attributes into a home console title that would appeal to the young gamer audience that they found with the GBA series. Critical reception for Network Transmission has been mostly average reviews. Although it received some positive remarks for its Battle Chip gameplay, many critics have complained that the game features a high or unbalanced difficulty level. The game's sound and its combination of 2D and 3D cel-shaded graphics have been met with varied opinions.